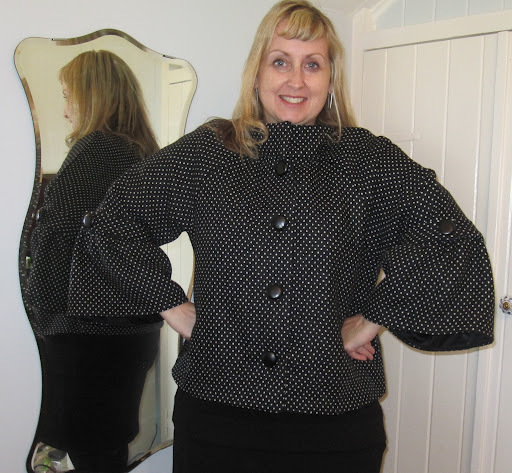 This is my latest creation (Butterick 5088) – finally finished after months of sitting on my dummy. I had several hurdles to completion, it took me ages to find buttons I was happy with and then it was hot over summer and so there was no motivation to finish it. Now is is getting colder at night in Brisbane I was finally motivated to complete it. I love the sleeve detail and slightly retro feel. It seems I have a fascination with spots right now having jsut bought black/white, red/white and blue/white fabrics for dresses and skirts. I couldn’t decide so bought them all. Yay another brissy girl! Love your jacket and welcome. I just started my blog too. I will have to find out where you get your fabric from because I am struggling to find nice jacket/wool material! Keep up the good work! The jacket fabric I bought from Spotlight a couple of years ago, they do have ok fabric every now and then if you are prepared to search! I also buy when I travel and online. Nice to meet you! Also, there is some really nice fabric at The Fabric Store in the Valley. Love your jacket.. I too …love,love polka dots.. Can't resist them. Happy sewing. Okay great thank you. I have seen okay fabric at spotlight but it's seems so much more expensive than the independent stores. I'll def check out the valley store thank you!